I am always on the lookout for great examples of marketing. We all know the big guys – Apple, Samsung (who has done an incredible job of parodying Apple lately), Geico, etc. But there are times when even the big guys could all learn something from creative small business owners. Case in point: Call Josephine Pet Sitting Services, run by Josephine Liskowski. But it’s how she markets herself that sets Josephine apart-from not just other dogsitting services, but most businesses. Are You Closing All the Business You Should? 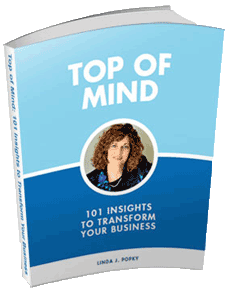 Closing business is critically important for consultants and professional service providers. Yet sometimes we get in our own way when it comes time to seal the deal. The language, behaviors, and beliefs we use with prospects can make us or break us. 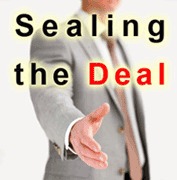 Attend the one-day Sealing the Deal workshop on June 11 in Mountain View, CA and learn the dramatic, action-oriented language that can help you close more business immediately. Readers of this newsletter are eligible to receive the Leverage2Market community rate. Register now to receive the Early Bird discount. e-book We are pleased to announced a new e-Book will soon by published on Disciplined Marketing for Building a Professional Services Practice. 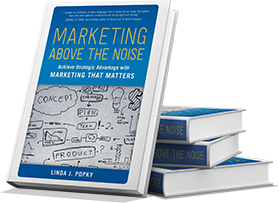 This e-Book, written by Linda Popky and Robbie Kellman Baxter, offers simple, effective advice for consultants and professional services firms who are looking to take their marketing to the next level. Linda presented Being Heard: How Non-Profits Can Stand Out From the Crowd – Workshop on Non-Profit Marketing, for KeyPoint Credit Union in February, and a webinar on Value-Based Retainers: What You Need to Know to Grow Your Consulting Business for Women in Consulting in April. Linda discussed how she’s integrated video into her marketing mix at WIC’s workshop on Marketing Your Consulting Business With New Media Tools in April. She also presented a segment about Marketing to the Million Dollar Consulting® College in Newport, RI on April 25th. Enabling Communities Through Collaborative Tools – Silicon Valley IABC, Panel Presentation, May 23. We are in the process of booking our Summer speaking schedule. If your business or association could use a dynamic, thought-provoking presentation or workshop on marketing or business strategy, please contact us at info@Leverage2Market.com.